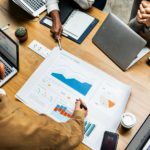 With this post, I just wanted to share something I have stumbled onto when using Azure Advisor service and related to the optimization of a cloud based SQL Server database. However, it applies to any version of Microsoft SQL Server, either cloud or on-premise. 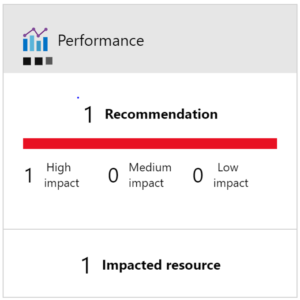 It all started when I randomly browsed the Azure portal and checked the Azure Advisor service : there I saw a recommendation marked as having a high impact. My first reaction was “wow, how can I have missed that ?!”. The performance recommendations detail screen showed it was about non-parameterized queries. So the recommendation is quite self-explanatory and is to use forced parameterization on the database, but let’s refresh our memories about what we are talking about here. Each time the database receives a new T-SQL query, SQL Server engine works with various processes to send back the query result. Let’s focus on the main 2 steps which are “Relational engine processes” and “Storage engine processes”. 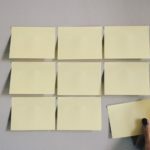 First, parsing the query: in this step, the engine parses the query and resolve the object names such as tables, columns, aliases… Once parsed, the query is compiled. Then, finding the “best” estimated execution plan (thanks to the Query Optimizer) : basically, the fastest the better. The Query Optimizer evaluates many parameters like CPU, I/O costs but it also refers to statistics stored in SQL Server. It might also consider that it will take too much time to calculate the optimal execution plan and decide to reply with a plan which is trivial. To make it simple, keep in mind that the query optimizer tries to get the best execution plan in the lowest timeframe. In any case, calculating the query execution plan has a high cost, so SQL Server stores the plans to reuse them. 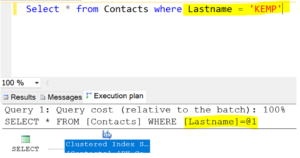 Using parameters in T-SQL queries can increase the reusability of the calculated execution plans, thus reducing the induced cost of calculation. A SQL server database can be configured with “Simple parameterization” or “Forced parameterization”. Depending on this configuration, SQL handles incoming queries in a different way. The default setting is Simple parameterization. The intended goal is to maximize the chance of the resulting query to match one of the existing execution plans. However, the relational engine may have difficulty determining which expressions can be parameterized and therefore only a subset of queries can be parameterized with Simple Parameterization. You can’t choose which query will be and which won’t be. So, if you have complex queries, you should parameterize them before executing them against the database engine. By specifying forced parameterization, and under certain limitations, the engine will parameterize all the literals within the SELECT, INSERT, UPDATE and DELETE statements. The engine will have a higher chance of reusing execution plans under the forced parameterization context.